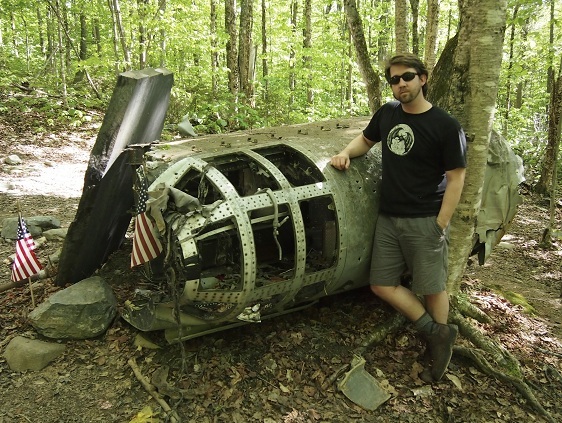 June 4, 2012 — In the last post, I wrote about hiking 4.5 miles round-trip up a small mountain to see the wreckage of a 70-year-old WW2 bomber. It was a unique and somewhat challenging experience, and one of the more satisfying of my OTIS jaunts for both of those reasons. Unfortunately, that feeling only lasted about two weeks, when I discovered that it wasn’t that unique of an experience and that there are easier ways to have it. 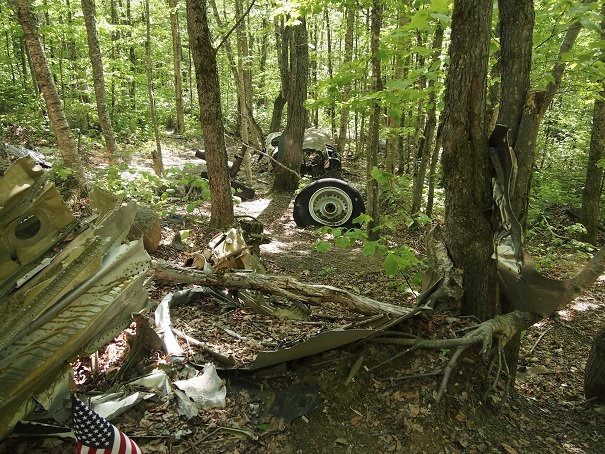 That was when I saw the crash wreckage of another bomber on the side of another mountain, which we drove right up to in our car, seatbacks reclined, AC on full, and cup holders stuffed with 7-11 bounty. This time I was in Maine, just outside the town of Greenville, about 150 miles north of Portland. 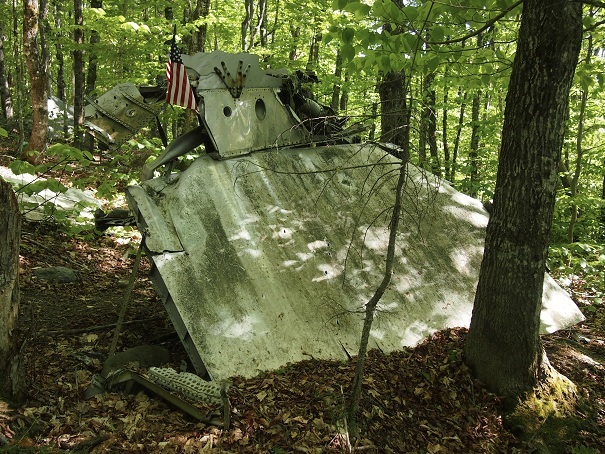 The wreckage was that of a Boeing B-52 bomber, and it dated back to the Cold War. 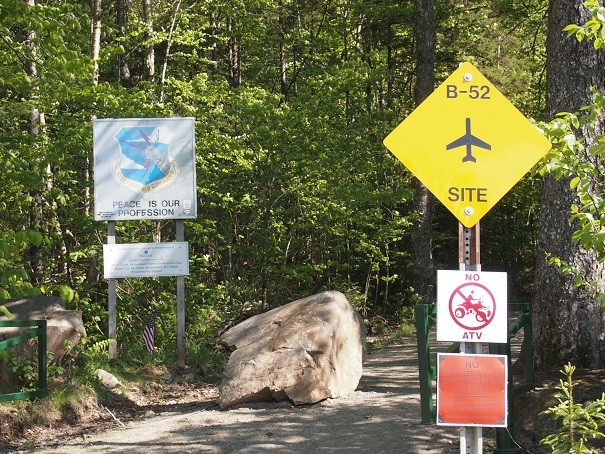 On January 24, 1963, the B-52 was running a training mission out of Westover Air Force Base in Massachusetts, the same base to which the Douglas B18 that I’d previously visited had been headed when it crashed two decades before. The purpose of this particular flight was to practice squeezing into the thin layer that existed between radar and terrain, thereby avoiding detection by the Soviets. However, during the low-flying mission, turbulence broke the vertical stabilizer off, causing them to become, well, vertically destabilized. Only three of the nine crewmembers were able to eject before the bomber crashed into the side of Elephant Mountain. All of the crew still onboard died, as did one of the men who ejected. The pilot and the navigator managed to survive, although they spent the night frozen and trapped on the snowy mountainside until rescue efforts were able to find them the next day. The navigator contracted frostbite and had one of his legs amputated. 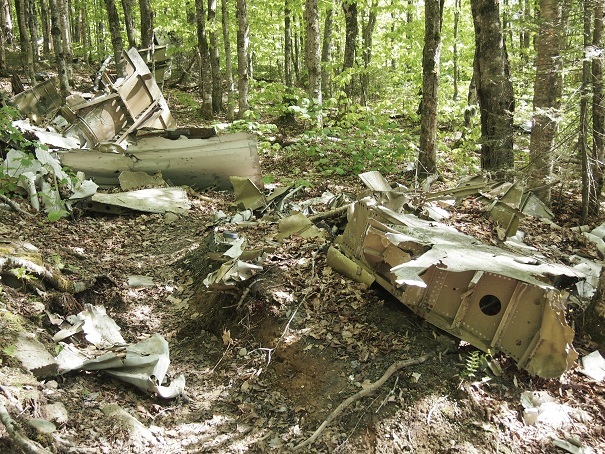 For the same reasons as the B18 crash site (difficulty of location gradually evolving into sacredness of location), most of the wreckage was left as is. Today, though, the spot is extremely easy to get to. That’s because the mountain is an active timber site and is crisscrossed by a network of well-maintained logging roads. Further helping out, small diamond-shaped signs with planes on them are interspersed along the route to ensure that you end up at the site and not face to face with sweaty men brandishing chainsaws. But you can do both, of course. A group of us happened to be holing up in a cabin nearby on Wilson Pond, and we decided to jet over there to check it out in between looking for moose (still haven’t seen one in the wild despite years of passing “Watch for Moose” signs on the highway) and trying to create the ultimate camp cocktail. We discovered the place to be basically handicapped-accessible. It even sports its own dirt parking lot, only a short path away from the wreckage itself (“commercialized” was how one old codger described the current state of the site to us before predicting our doom out in the wild). There were about a dozen or so people visiting the site while we were there, which doesn’t sound like a lot, but when you’re in the middle of a forest, any number of people is a crowd. Plus, everybody wandering slowly around looking downward made me feel like I was at a yard sale for some reason. Still, it would take a lot more than having to share it with other people for this site to not be cool. 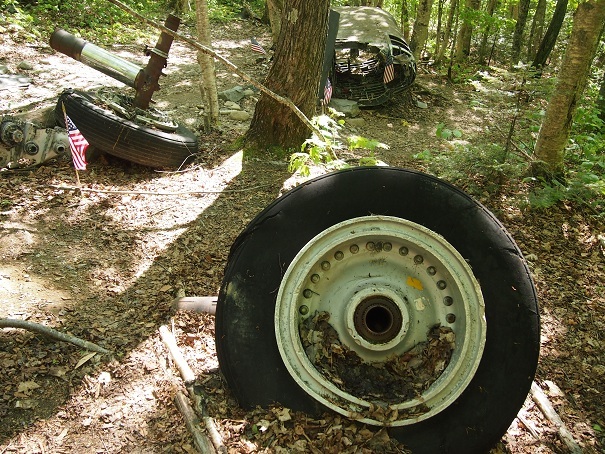 The B-52 is a much larger plane than the B18, so there was a lot more wreckage. 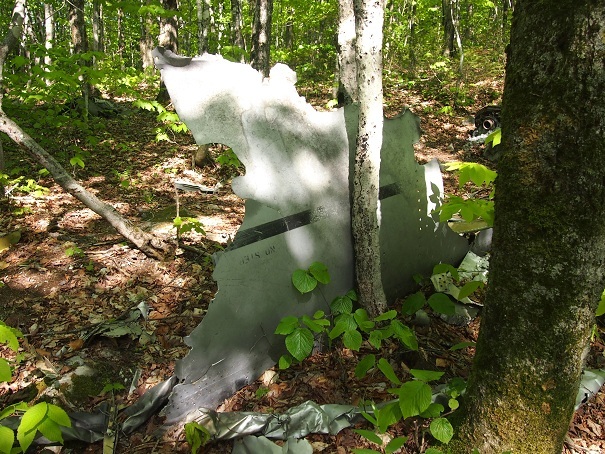 In addition, the wreckage was in larger pieces and included landing gear, an engine, and pieces of metal stenciled with labels like “fuel tank mid body,” “outbd equip drain,” and “no step” that only applied when it was a plane. Actually, that last one might still be applicable. Some pieces were even lodged in the branches of trees, although whether that dates back to the crash itself or were stuck up there for style points by whomever turned the place into a tourist spot, I don’t know. A short path wraps itself around the largest pieces, and you could see plenty of smaller bits of metal scattered off in the distance of the forest, tempting you into its depths to see what else could be discovered…which I’d say is probably not much at this point in time, if it weren’t for the fact that just last year they found another of the ejection seats. Two had been previously recovered, one of which is on display at a local snowmobile clubhouse in town and the other at a museum in Bangor. 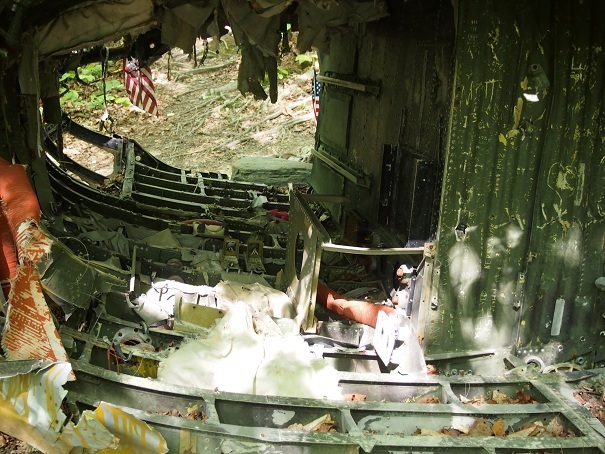 However, the bit of wreckage you always see on Google Images is the fuselage. This is probably where they’ll eventually sell souvenirs and lemonade. A large section (about 4x5x10 feet) of the plane body remains intact and you can see inside of it through its shorn-off end. There’s nothing much in there, but it’s an interesting change of perspective to see the inside of the plane wreck. 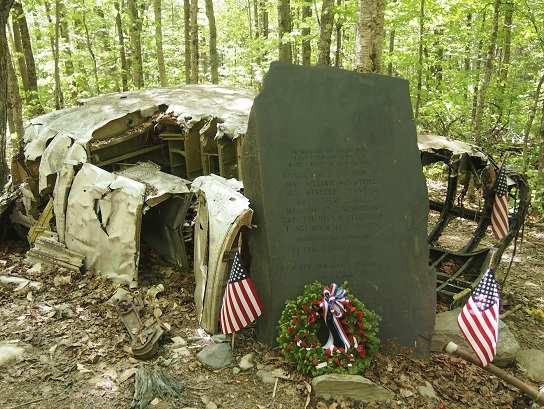 A large stone memorial bearing the names of the bomber’s crewmembers leans against it. So two old bomber wrecks in two weeks. But I don’t want you to think I’m jaded, despite my introduction. 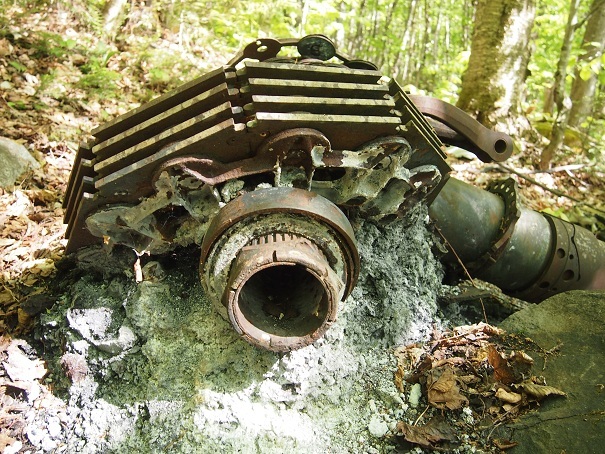 Truth is, in situ decades-old airplane crash wreckage is way cool (as long as its decades old, of course), no matter how many you’ve seen. And apparently there are a lot to see. I’ve already heard of two more since posting last week, one in Success, NH (thanks, Shawn and John), and one in Milford, NJ (thanks, Joey). Feel free to let me know of more in the comments or on Facebook. And, meanwhile, add “crashing bombers” alongside angry bears, treacherous climbs, and getting lost to the list of dangers to be prepared for when hiking on forest mountains. And take moose off it. They’re imaginary.